Click on the image of the migrating Chinook salmon twice to enlarge it page width full size. The Siletz River enters Siletz Bay just west of the historic town of Kernville and enters the ocean just south of the Community of Taft at Lincoln City. Do not attempt to cross the bar at Siletz Bay at anytime. Ebb currents at the shallow entrance can reach 5 to 7 knots. Boaters inside the bay should be wary navigating near the mouth. Loosing power while boating at the entrance to Siletz Bay can cost you your life and the lives of all those onboard. The term, "shallow entrance" implies shallow water which it is not! Children falling into or attempting to swim in the deep water channel that runs along the North Shore can be swept into the ocean in the blink of an eye. Click on the image of Siletz Bay to enlarge the photo. Click on SILETZ BAY to view a map of the crabbing and clam digging resources in Siletz Bay followed by a photo array of clam diggers taking purple varnish and softshell clams and the crabbing video clip of my friend Dustin crabbing. At the turn of the century Oregon’s ninth largest bay was a deep water port of entry, but over time the bay has been subjected to extensive sedimentation. Studies show the ocean is the source of most of the sediment deposited on the tidal flats in the bay. The numerous logs and root wads marooned on the tidal flats have become small islands. The bar at the entrance to Siletz Bay is dangerous to cross. Not at any time should the small boater attempt to cross the bar. You have to use caution when crabbing or fishing in Siletz Bay. You should only crab or fish in the lower bay on a high incoming tide. The high current velocity of the major tidal phase of an outgoing spring tide reaches seven knots at the entrance, enough force to pull an underpowered vessel or one having engine failure over the bar into the surf jeopardizing the lives of all aboard. 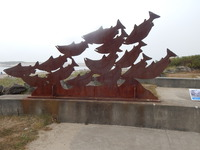 Siletz Bay is one of Oregon’s most popular bays to fish for Chinook salmon. The Siletz River has both a summer and fall run of Chinook salmon. Chinook salmon kickoff the fishing mania when they begin returning to the bay in August drawing hundreds of anglers to the north shore. All of the excitement generated by returning salmon continues through October. On 08/30/18 Chinook salmon tagged along the North Shore of Siletz Bay by local angler. 08/16/18 fishing for Chinook salmon is slow but some fish are being tagged in the jaws at the entrance of the bay. 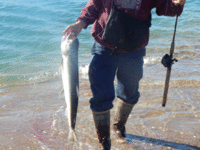 On 10/09 fishing for Chinook Salmon continue to enter Siletz Bay with some being tagged. The Siletz river is experiencing strong numbers of returning Coho salmon. On 09/27/15 Fisherman and artist Brian is landing Chinook salmon in the video clip. Fishing for Chinook salmon at the jaws has busted loose with some limits being taken by guide boats. Fishermen Soto and Steve are pictured with the Coho salmon they caught fishing from the north shore of Siletz Bay. Fisherman Steve is pictured with his first Chinook salmon that he also caught while fishing from the north shore of Siletz Bay. Click on Chinook Salmon 2017 to view the Chinook salmon landed along the North Shore of Siletz Bay on 09/22. Click on the image to enlarge it. 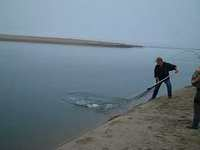 Chinook salmon return to Siletz Bay during the spring and in the fall. Fall fishing for salmon exceeds crabbing in popularity when the salmon are returning to Siletz Bay. The master of the salmon demanded tribute from Indians before they could pass Medicine Rocks according to the Siletz Indian legend. Medicine Rocks consists of three rocks, on two of which the heads of persons may be recognized. On the left side of the master of the salmon stands his wife, both of them easily recognized; on his right side is their dead child. * Honor the legend by leaving something and the salmon will return forever. Historically, the number of returning spring Chinook salmon is small. The catch rate for spring Chinook averages a 170 fish per year. The run begins about the last week of May peaking June and running into July. Spring Chinook unlike their fall cousins spend very little time in the bay or the lower tidal reach but instead hold in the upper tidal reach of the river channel. Fish for spring Chinook salmon 6 miles upstream from the Highway 101 Bridge to the head of tidewater located 15.5 miles upstream at Cedar Creek. Launching facilities are limited in the upper tidal reach of the Siletz River. Launch a boat at Strom Park and fish with the incoming tide to the head of tidewater or fish downstream to Sunset Landing with the outgoing tide. Fishing is also productive in the river above the head of tidewater. Launch at Morgan Park and fish the deeper holes to the takeout at Strom Park but the drift boater must be prepared to deal with the tide. Historically, small numbers of fall Chinook salmon enter the Siletz River from the last week of August through the middle of September. The number of returning fish increase during the last half of September peaking in October. The catch rate averaged approximately 1500 fish per year and is dominated by a high percentage of 5 year old fish followed by 4, 6 and 3 year old fish. The best fishing for newly arriving fall Chinook salmon occurs in the lower bay during the incoming tide of the major tidal exchange of spring tides or neap tides especially when the incoming tide coincides with sunrise or sunset. The next most productive fishing period occurs at sunrise or sunset during the incoming tide of the minor tidal exchange in the daily tidal cycle. Daybreak is that magical time of day when Chinook salmon bite the best. Be sure to have the bait in the water one half hour before sunrise. Fishing is most productive from ½ hour before sunrise to midmorning and from late afternoon until ½ hour after sunset. The main channel runs northwest from the Highway 101 Bridge towards the sand spit turning north paralleling the sand spit to the bar. The approximately five mile boat ride from Siletz Moorage to the bar discourages anglers from fishing in the lower bay. Early in the run concentrate fishing in the lower bay trolling a plug cut herring with the incoming tide from the entrance at the bar along the channel paralleling the sand spit to the Hwy 101 bridge. Troll or back bounce with the outgoing tide from the Highway 101 bridge to the sand spit with a plug cut herring. Stay well clear of the entrance to the bar and the lower bay during the outgoing tide. Back bounce or back troll with the outgoing tide from Sunset Landing downstream to the Highway 101 Bridge fishing with bait wrapped Flatfish lures, spinner bait combinations, spinners or wobblers. Fish upstream from Windy Bend drifting with the tide or by anchoring above the deeper holes during the last half of the outgoing tide through low slack tide fishing with a bobber using a walnut sized gob of salmon eggs and sand shrimp. Accent the salmon eggs and sand shrimp with a small length of pink, red, chartreuse or orange yarn. Historic catch statistics represent a window of opportunity for catching the salmonids returning to the Siletz River Basin. Click on Sport Catch Statistics - Salmon, Steelhead and Sturgeon to view the catch statistics for the salmonid species of interest. The reports on this page represent harvest statistics gathered from sports harvest angler tags (punch cards) returned by anglers to ODFW. This sports harvest data has not been verified by ODFW and may be inaccurate for several reasons. Errors may arise from anglers incorrectly reporting locations, dates, and/or species of catches; or from errors in data entry caused by difficult-to-read harvest cards. According to the annual Recreational Coho Catch Statistics the number of hatchery Coho salmon catch rate for Coho returning to the Siletz River vary less than 1000 fish annually until 2014 when 2700 retuning hatchery Coho were tagged and 2015 when 1000 returning hatchery Coho were tagged. According to the monthly Coho catch statistics. Coho salmon begin returning to Siletz Bay in late August, peaking in September through October before declining in November and early December. Most anglers target Chinook salmon when fishing the Siletz River; however, when retention of hatchery Coho is allowed anglers target both Chinook and Coho salmon in the lower Siletz Bay. 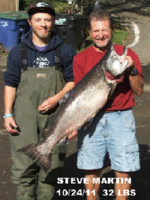 With the exception of private property in the Siletz valley fishing for all salmonids from the bank of the river is angler friendly in large reaches of the Siletz River especially in lower Siletz Bay. Troll in the lower bay from the sand spit near the bar trolling plug cut herring, hoochies or streamer flies with the incoming tide to the Highway 101 bridge. Troll these baits behind a diver or wire spreader or diver in the upper half of the water column. Troll in lower tidal reach in the river channel from the Highway 101 Bridge to Sunset Landing with plug cut herring, pink, rainbow or chartreuse colored spinners. Remember Coho salmon prefer bait trolled near the surface at speeds between 3 and 5 knots. The Siletz River also has a native summer steelhead run, the only one in the Oregon Coast Range. Cutthroat trout return to Siletz Bay from the middle of July through August. Early in the run fish from the Cannery Hole seaward to the Siletz Spit during the incoming tide trolling Doc Shelton spinners rigged with night crawlers. After the first week of August fish the entire length of the upper reach of tidewater trolling Doc Shelton spinners rigged with night crawlers. Fish from shore in the upper tidal reach of the estuary casting spinners or by fishing on the bottom of the deeper holes with night crawlers or crawfish tails. At one time Sand Sole entered Siletz Bay in small numbers from April through August. Angler Steve nailed 10 Chinook over the season plus several coho and his friend Soto nailed two chrome bright silvers from the north shore of Siletz Bay. The silvers hit polished chrome spinners with pink skirts purchased from Knight's Tackle Box east of Otis on Hwy 18. There were several other fish hooked but not landed. The silver was Soto's and Steve's 2nd and Steve's forth of ten tagged Chinook salmon this season. All caught from the north shore of Siletz Bay. Steve estimates 3500 cast for each salmon. Angler Steve caught 9 Chinook and several coho. Steve fished every available opportunity to achieve his fine catch during the 2011 season. Steve averaged 3500 casts between fish. From the left, Steve's first Chinook, his ninth and his third@!!! Fish and Shellfish Consumption Advisories and Guidelines Softshell clam advisory for Oregon Coast. The CDAO does not recommend consuming contaminated clams or fish species of any species. However the purple varnish clams in the Siletz River Estuary are free of contamination from arsenic; and the clams have not been contaminated by Domoic Acid or PSP that have closed the Oregon Coast to the taking of razor clams and mussels. Always Check Oregon's Beach Monitoring Program. The Oregon Public Health Division conducts several activities to protect people living, working and playing near Oregon's beaches, rivers, lakes and other water bodies. Oregon's Beach Monitoring Program helps protect people who play in the coastal waters. The program does regular water testing to look for high levels of bacteria and lets visitors know when there is a health concern.